Based on an Iraqi dish of liver and onions that I ate in a simple workers' cafe in Kuwait, with the soccer playing on the TV and the food served fast and generously on plastic plates. This version is with chicken thighs and is the business. The spices and vinegar mellow in baking and produce a subtle flavour that works well with Lebanese-style baked potatoes. 2. Put the spices, salt, oil and vinegar in a large bowl and mix together. Add the chicken and rub the marinade into every bit of the skin and flesh. Leave for 10 minutes then place the thighs on a roasting tray and bake for about 30-40 minutes until cooked and crisp. 3. Meanwhile, about 15 minutes before the chicken is ready to serve, peel and slice the onions, place in a saucepan and pour on any juices from the tray the chicken is baking on. Cook the onions with a lid on for 10 minutes until they soften then remove the lid and cook until the liquid evaporates, and the onions appear soft and golden. Spoon the onions into the base of an ovenproof serving dish, place the chicken on top and keep warm until ready to serve. 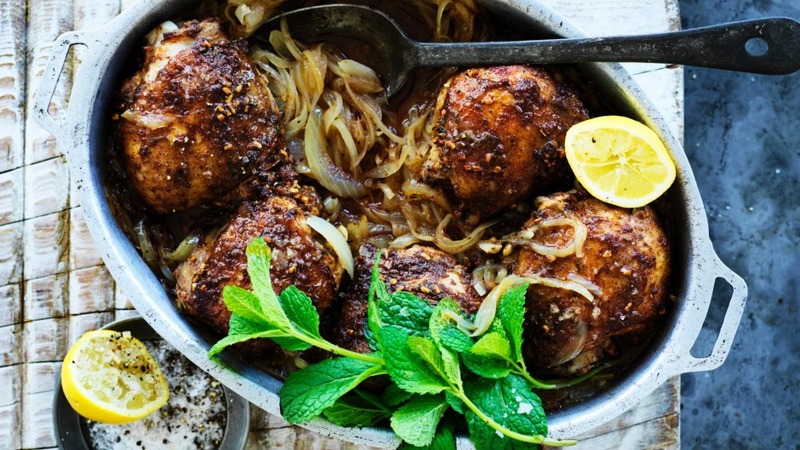 Serve with my Lebanese-style baked potatoes.